In the beginning God created the heaven and the earth – and Sarkis said, let there be white. And there was white all over the already-white cube, the achromatic colour being the single leitmotif (or should that be light-motif?) in his third exhibition at Nathalie Obadia. Indeed, whiteness immerses the viewer here in an alabaster mist, and is diversified across a surprisingly large corpus for a show confined to a single room: over 80 artworks, more than the Paris-based Turkish artist (b. 1938) has blown out candles. Most of them are recent series of oils on paper, 50 of these arranged in a metal cabinet at the visitor’s disposal, the others scattered on the walls of the gallery. The remaining works comprise four neon wall sculptures, a silent film and ten mixed media pieces (framed glass works, watercolour on photographs, and assemblages). Talk about a chaos that requires some serious enlightening. Working with pure materials, Sarkis’ conceptual and minimalist aesthetics is in fact essentially, and multiculturally, referential. The history of humanity is, for him, not just a source of inspiration but sometimes the actual springboard for his own practice. With After Ice Age (2013), the collection of 50 oils on paper displayed in wire-mesh stacks, Sarkis goes back to the origins of art. At the centre of each sheet, within a thick mass of titanium white paint, is modelled a female, male or animal effigy, all of them made after specific and captioned prehistoric bone statuettes from 40,000 to 10,000BC, presented last year in the British Museum’s exhibition Ice Age Art: Arrival of the Modern Mind. While the whiteness of the paper makes completely apparent the natural expansion of the paint medium – linseed oil, it appears – outside of the figures delimited by the brush, the resultant stains around each prehistoric Western idol resemble here haloes, aureoles. Speaking of Christian dialectics, La colonne vertébrale du Retable d’Issenheim de Grünewald (2012), one of the neon wall sculptures, reproduces in fluorescent tubes the outline of the famous crucifixion altarpiece. Another light-based piece, After Sátántangó – Belà Tarr (2013), uses a single tube to divide in half an enlarged photograph of a child from the Hungarian director’s 1994 film, whose title literally means ‘Satan’s Tango’: white being also symbolic of innocence, here threatened. And while the eight glass works of Vitrail touché à blanc (2013) bear multiple white fingermarks from Sarkis and his master glassmakers (Helder da Silva and Anne Ellus from Lux Maxima), the series Image touchée (2013) further encourages viewers’ haptic capacities, inviting us to lift up silk curtains – like a defloration, if you will – covering four abstract photographs, only to discover in the middle of each the single white fingerprint of the artist, using watercolour. Is this defiling really a sin, though? Beyond the evident references to Christianity or the Demiurge, the overall theme of the show reminds me here of albedo, the second ‘white’ stage of the Magnum opus – the alchemical work of creating the philosopher’s stone, fabled elixir of golden metamorphosis and life – during which the chaos or ‘black’ matter of the previous phase, nigredo, is cleansed and purified. For Sarkis is, after all, some kind of an alchemist. 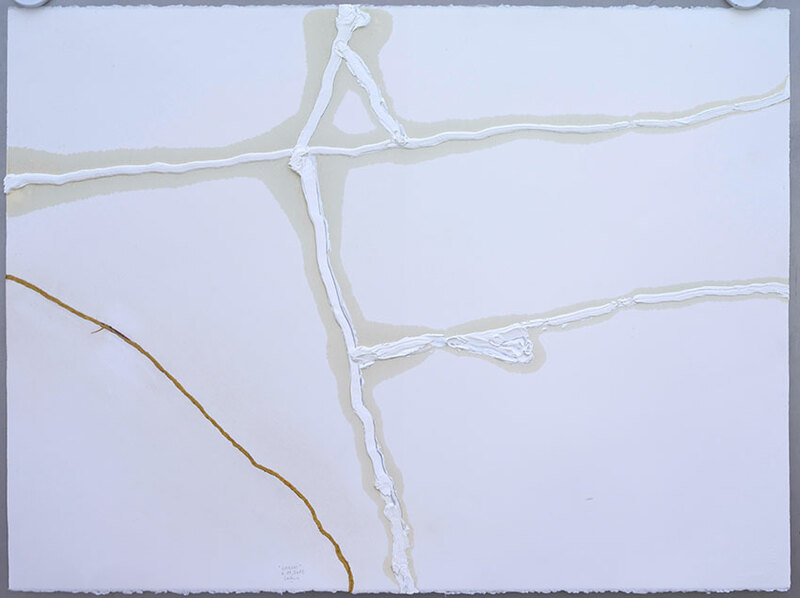 Suitably enough, while experimenting with a fifteenth-century Japanese technique of fixing broken ceramics with gold powder and resin in D’après Urushi (2012) and Kintsugi libre (2013), the artist happens to have delicately put back together torn white sheets for the one and a ripped-up photograph for the other. Golden repair? Aren’t transmutation and rejuvenation the exact purposes of the philosopher’s stone? There are further stages to the alchemical Magnum opus, but here a transformative process feels completed, and a ‘Great Work’ indeed it is.